Two blogs ago, I mentioned the current interest in cupping among celebrities such as Olympic athletes and actors. There are surely easier and safer ways to obtain a placebo effect. The mechanistic theory that originally underpinned therapies in Western medicine, such as cupping, blistering, bloodletting, emesis, and purging, was that of the four humours, which was known to ancient civilizations, such as those of the Babylonians and Egyptians, but whose development is mainly associated with Greek medicine, and Hippocrates in particular. 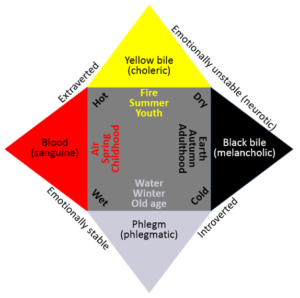 The Greeks called the four fluid humours of the body, αἷμα, blood, φλέγμα, phlegm, χολή, [yellow] bile, and μέλαινα χολή, black bile. According to Galen, in Περί κράσεων (literally On Blending Fluids), in Latin De Temperamentis, each humour was either warm or cold, wet or dry, and each was associated with a season and one of the four elements, earth, air, fire, and water. The mood with which each was also associated was called a temperament: sanguine (optimistic), phlegmatic (stoical), choleric or bilious (irascible), and melancholic (depressive). As recently as the 1940s Hans Eysenck, in Dimensions of Personality, extended these ideas to other categories of the personality, labelled introvert and extravert, and emotionally stable and unstable (neurotic). 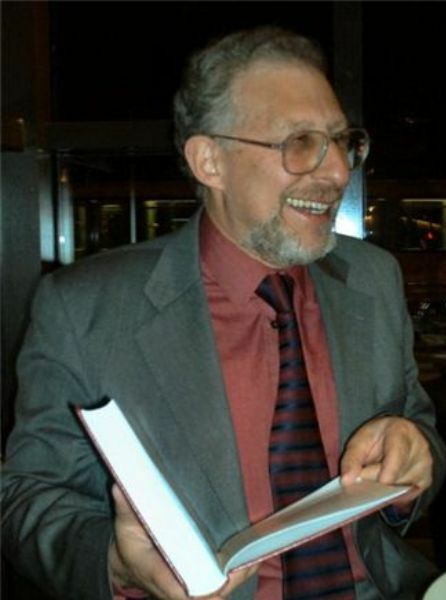 He was not alone; the list of theories based on these imaginary associations is very long. The figure illustrates some of these notions. If a disorder was due, for example, to excess blood, it could be treated by bloodletting. Bloodletting or removal of blister fluid produced by cupping or by applying agents such as cantharides or mustard plasters (sinapisms), and the use of emetics and cathartics, removed “naughty humours”. Today similar notions underlie the removal of vague “toxins”, without any mention of what the kidneys and liver are presumably failing to do about them. Some foods and medicines were supposed to possess temperamental properties for counteracting ill humours. Wine, for example, a choleric, was regarded as an antidote to excessive phlegm. Cultural references to the four humours abound. Ben Jonson’s play Every Man in his Humour features characters of different temperaments, such as Bobadill, a braggart soldier, and Kitely, a jealous husband. Shakespeare was in the cast for the first performances of the play in 1598. In two of his sonnets, first published in 1609, he invokes the humours as metaphors for his body and mind. In Sonnet 44 he likens the composition of his body to the two heavy elements, earth and water, speaks of the heavy tears that he sheds at the absence of whoever it is to whom the sonnet is addressed, and regrets that his body is unable to “leap large lengths of miles” to remedy that absence. In Sonnet 45 he likens his thoughts and desires to the two light elements, air and fire, which “are both with thee, wherever I abide”. Left with the other two elements, his life “sinks down to death, oppress’d with melancholy”. It has also been suggested that a suffixed form, UG-M, is the root of the Latin word umere, to be moist, and umor, moisture, liquid, or a bodily fluid or discharge (compare the Greek χύμος, jiuice, from which we get chyme).Then, by association with humus, the ground or earth (Greek χᾰμαί = on the ground), umor became humor. A humectant is anything that retains moisture, such as skin moisturisers and substances used to stop cigarettes from drying out. So the four bodily fluids, normal or abnormal, were humours, as were the aqueous and vitreous of the eye and the crystalline humour (the lens). By virtue of the Galenic theory, a humour became a temperament—good humour or bad humour—and then anything that put you in a good humour or an ability to appreciate or express such a thing—a sense of humour. With the roots of humour in moistness, one wonders where that leaves dry humour.